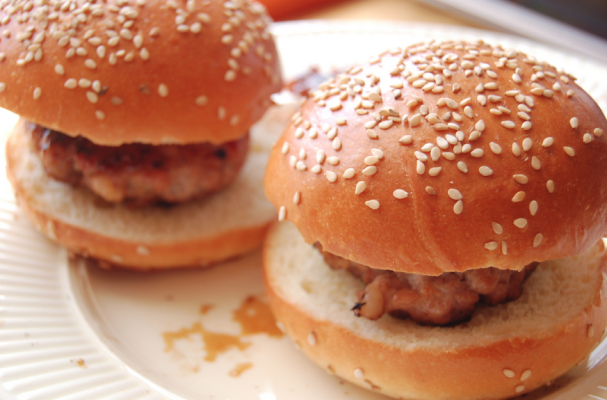 If your Dad is a meat and potatoes kind of guy then he is going to fall in love with these mini meatloaf sliders. This classic American recipe is transformed into a hand held meal that can be enjoyed throughout the summer. Mini meatloaf patties are cooked on the grill before they are piled high with potato, cheese, tomato and onion. I like to glaze my patties with barbecue sauce to add an extra layer of flavor and keep them moist. Step 1: Heat the olive oil in a medium skillet over medium high heat. Add the garlic and onion and saute until fragrant, about 5 minutes. Remove from heat and set aside to cool. Step 2: In a large bowl, add the ground beef with the onion mixture, ketchup, dijon mustard, Worcestershire sauce, salt and pepper. Mix by hand until the ingredients are incorporated. Add the breadcrumbs and mix again, taking care not to overwork the meat. Step 3: Preheat the grill. Form patties that are approximately 3 inches in diameter. With your index finger, create a small divot in the middle of each patty. Cook the patties for 3 to 4 minutes on each side. Before removing from the grill, baste each patty with barbecue sauce. Place slices of Swiss cheese on each patty and allow to melt. Step 4: At the same time you are cooking the sliders, grill the potato slices. Coat the potato slices with olive oil and season with salt and pepper. Cook the slices until tender. Step 5: Assemble the meatloaf sliders by placing the grilled potato slice on the bottom layer and top with patty. Add sliced tomato and onion, if desired. Serve with your favorite condiments including more barbecue sauce.